Not all DI applications require the electrical isolation offered by a transformer, and Orchid's designs offer superb performance at low prices. 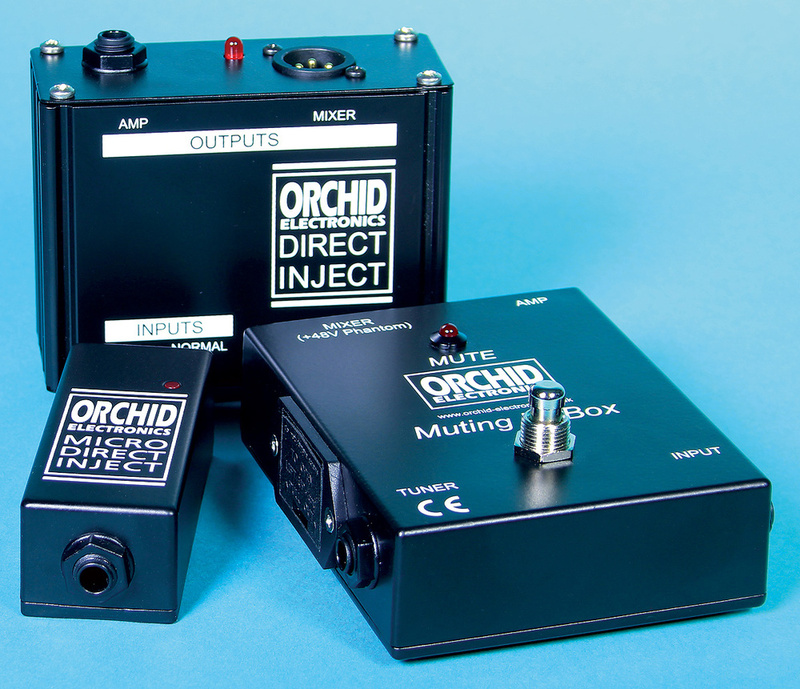 British manufacturers Orchid Electronics design and build a range of stage and recording accessories, including an interesting selection of passive and active DI boxes which have developed quite a cult following, particularly on the folk music scene. They've been in business for about 25 years but came to my attention only recently, so I contacted Orchid's owner/designer John Godsland to request some DI boxes for review, and he sent me his Micro, Classic and Muting DI boxes. These active DI designs share the same core circuitry, but offer different features. What's interesting is that they eschew the usual output transformer, and instead employ a dual J-FET opamp to receive the guitar signal (with an input impedance of around 1MΩ), and drive the cable directly with a symmetrical, balanced output. The very high input impedance is ideally suited to piezo pickups on acoustic guitars, but also matches electric guitar pickups and 'bugs'. A permanent ground lift is built into the circuitry on the input side to minimise the risk of ground-loop problems. The main reason most DI boxes employ an output transformer is to provide electrical isolation between the source and destination equipment. As well as preventing ground loops, this offers protection against faults in equipment on one side of the DI box damaging that connected to the other, though whether all DI boxes employ transformers with a sufficient safety rating to guarantee that isolation is another matter! Cheap transformers usually introduce significant amounts of harmonic distortion and struggle with low frequencies and high levels, but a good quality, low-distortion, electrically safe transformer is inherently expensive. If a DI box is being used with a fuzz guitar these things are perhaps less important… but they can stand out like sore thumbs when used with a good acoustic guitar, for example. By driving the output electronically instead, the Orchid boxes achieve some very impressive specifications while keeping the price low. The Micro DI is the smallest active DI box I've ever seen: at 95 x 30 x 35mm it's just big enough to accommodate a male output XLR at one end and an input jack socket at the other. This box can only be powered via standard phantom power, and a bright red LED illuminates when power is present. Operation is simple, as the Micro DI can only be used one way: a guitar or other instrument is plugged into the jack socket, and an XLR cable takes the balanced mic-level output to a mixing console. Total harmonic distortion and noise (THD+N) is below 0.01% for input levels between -21 and +15 dBu, which is better than that of all of the similarly priced active DIs that I've tested, and a huge headroom margin caters for a maximum input of +16dBu. For comparison, my vastly more expensive Radial J48 active DI box exhibits slightly lower distortion than the Orchid Micro DI, but clips at about +3dBu. Switching in its input pad allows it to cope with +16dBu input levels, but only with a considerably higher THD+N figure. The Micro DI's frequency response is essentially a flat line from about 15Hz to well over 50kHz (matching that of the Radial J48). Interestingly, the Orchid DI introduces a loss from input to output of just under 10dB, padding down a guitar signal to nominal mic-level. By contrast, the J48 boosts the level by about 5dB, or introduces a 10dB loss if the pad is switched in. Looking at a full-spectrum Fast Fourier Transform with a -15dBu input signal, the Orchid's averaged noise floor is a little quieter than the J48's, essentially because of their differing gain structures, but it also has less harmonic distortion. The Micro DI also appears less susceptible to mains-hum ripple on the phantom power. Given the price, then, these are seriously impressive results! My bench-test results for the Classic DI were identical to those for the Micro DI when running on phantom power. This larger unit can also be powered by a PP3 9V battery, at the cost of compromised performance: with a brand new Duracell Plus battery installed, the most obvious issue is a huge reduction in headroom, with the clipping level reduced to around +5dBu. In practice this is unlikely to be significant in most guitar-based applications, but clearly phantom-powered operation is preferable, with the battery option providing a useful emergency backup. The unit powers up automatically from its battery (if fitted) when an input is plugged in, but will switch automatically to phantom power when applied. (An LED indicates the presence of phantom power). Battery current consumption is only 4mA, so a standard copper-top battery should last well over 100 hours. The Classic DI sports two input jack sockets, one for instrument-level signals and the other with a 20dB attenuator for 'hot' sources (up to +36dBu). Most DI boxes provide a simple 'link' or 'thru' socket hard-wired to the input jack, but the Classic DI box features an actively buffered unbalanced output on a third jack socket next to the mic-level XLR output, and this is intended to feed a guitar amp. The Muting DI features a footswitch to mute the outputs, a feature that should be handy for musicians who need to kill the guitar output easily, perhaps when tuning or swapping instruments. At 120 x 100 x 35mm this box is slightly larger but thinner than the Classic. A chunky momentary foot-stomp button on the top plate toggles the electronic muting function on and off, with the status indicated clearly by a red LED. A single unbalanced input socket is provided, along with the balanced mic-level XLR output and a buffered unbalanced feed for linking to an instrument amplifier. Both outputs are muted when the footswitch is pressed, but an additional unbalanced output remains 'live' regardless of the mute switch status, and is intended to feed a tuner (or other appropriate destination). The Muting DI powers up in the muted mode. As with the Classic a PP3 battery may be used, with similar consequences. The technical performance is very similar to the other models, but the THD+N figure is slightly higher for input levels above about 0dBu. It's still below 0.03 percent, though — a very minor discrepancy, which is probably due to a small non-linearity associated with the solid-state switch component. It certainly isn't audible in use, and the muting function performs very well, introducing over 75dB of attenuation. I used all three DI boxes with a variety of electric guitars and basses, keyboards and acoustic guitars with various types of pickups. In all cases the results were nothing short of superb, delivering a bright, clear and extremely clean sound to the console, devoid of any ground hums or audible electronic hiss. Other than the level difference, there was very little change in sound quality when swapping out the Orchid products for the Radial box, while switching to a generic budget DI box introduced a noticeably harsher, grittier sound character, especially with higher input levels. These three DI boxes are very impressive performers that stand up extremely well in direct comparisons with a Radial J48, which is one of the best transformer-based active DI boxes currently available. In simple terms, the harmonic distortion and noise levels are very similar, while the headroom margin is considerably greater. The internal construction of Orchid's products is exemplary, with full-sized components on high-quality PCBs and very neat wiring. The cases are extremely sturdy and high-quality connectors are used throughout. The built-in ground-lift circuitry seems highly effective at preventing ground loops, even in some particularly contrived and convoluted systems which I knocked together. In situations where the equipment connected to these DI boxes is known to be well maintained I'd have no qualms at all about the absent output transformer, but there are a couple of situations where the transformerless boxes may prove inferior to more conventional transformer-coupled designs such as the Radial. The first is when connecting the output of a laptop or computer interface to a mixing console or recorder, as computer ground-noise is more likely to become audible as nasty buzzes and whines. The other is when connecting equipment of unknown condition or connecting to equipment powered separately in an OB truck or separate building. In these cases the galvanic isolation of a proper isolating transformer can, quite literally, be a life-saver. For typical home-studio applications, though, and for stage gigs, these Orchid active DI boxes are just the ticket. With outstanding performance that closely rivals the recognised leaders in the DI box world, combined with astonishingly attractive prices, these Orchid active DI boxes make an absolute no-brainer purchase, and I recommend them highly. Astonishingly good value for money. Do not provide true galvanic isolation, which is required for some DI applications. The unusual transformerless designs bring the twin benefits of lower cost and higher performance. Although the absent coupling transformer presents disadvantages in a few specific situations, they're irrelevant for most typical applications. Micro DI £25; Classic DI £36; Muting DI £64 including VAT. Orchid Electronics +44 (0)1392 438844. Micro DI £25; Classic DI £36; Muting DI £64 including shipping.